There are two kinds of Focaccia in my opinion. Light and bread like versus soft and chewy. Both have their charms and supporters. The last post I did of Focaccia is more of the bread type. 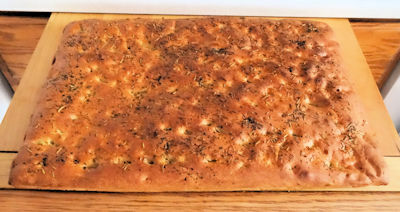 This time, I decided to go for the one with more substance and made Garlic Focaccia. I started by putting the garlic in the oil in a small pot. I put the pot over medium high heat and cooked until the garlic was just golden. Do not brown the garlic. Remove from heat and let cool. I put warm water, sugar and the yeast in the bowl of my stand mixture. I let it sit for 10 minutes until the yeast gets foamy. I added the garlic/oil mixture, more water, the flour and salt. I put the bowl on the stand mixer with a dough hook and turned it on for one minute. Then I scraped the bowl and turned the mixer on for eight minutes. There should be a somewhat soft dough. Turn it out onto a floured surface and form it into a ball. Put olive oil in the bowl and turn the dough to coat. Cover and let rise for 1 hour in a warm place. 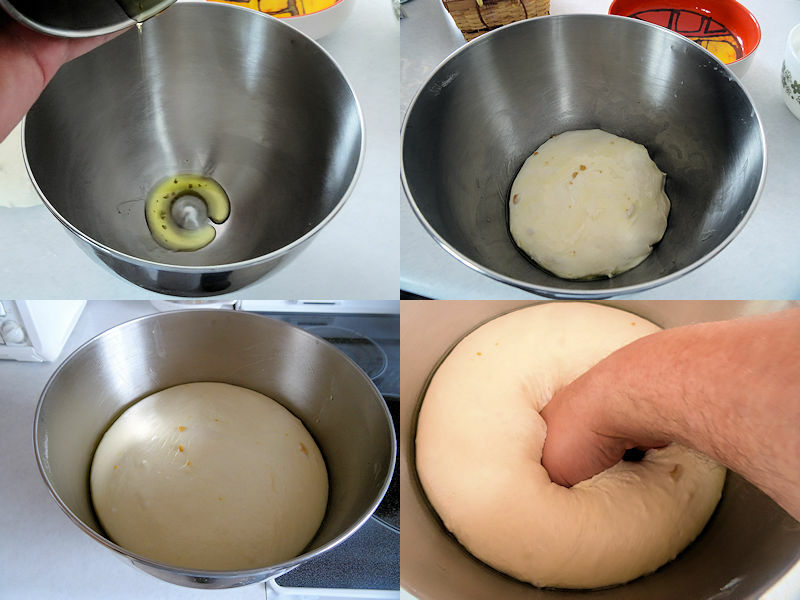 Punch your hand into the centre of the dough to deflate it. Grease a baking sheet with olive oil. Turn the dough onto it and press it out to the edges. If the dough shrinks back, let it sit for 10 minutes and press out again. Cover the dough and let it sit for 20 minutes. Preheat the oven to 450 F.
Press your finger tips into the dough to make many small depressions. Drizzle olive oil over the top and sprinkle the herbs over the top. Bake for 25 to 30 minutes until the focaccia is a nice golden brown. Brush the surface with olive oil. 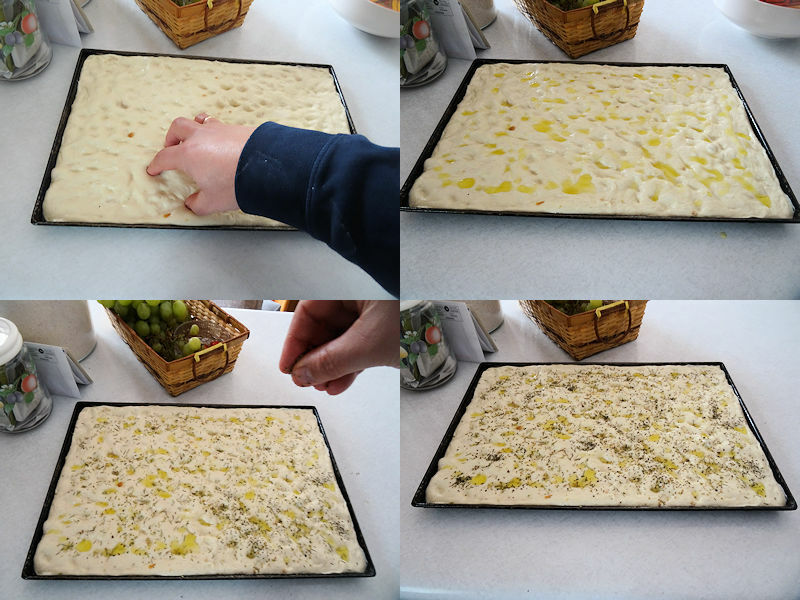 Cut the Focaccia into squares for serving. This has a nice strong garlic flavour, a moist soft interior with a chewy crust that gives it a great bite. If you like a chewy focaccia, this is it. 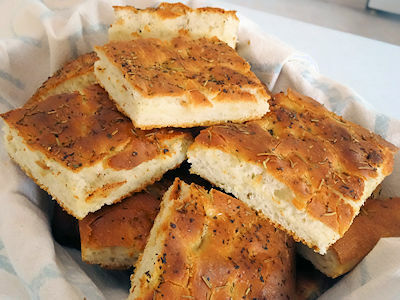 If you want a softer focaccia make my prior recipe. Put the 25 ml (2 tablespoons) olive oil and garlic in a small pot. Put over medium high heat and cook until the garlic is just golden. Do not brown the garlic. Remove from heat and let cool. Mix yeast, sugar and 125 ml (1/2 cup) warm water in the bowl of a stand mixer. Let sit for 10 minutes until foamy. Add the oil/garlic mixture, flour and salt to the yeast mixture. Put the dough hook on the stand mixture and turn it on for 1 minute and scrape the bowl and hook. Turn the dough hook on for eight minutes. You should have a soft dough. Turn the dough onto a floured surface and from it into a ball. Put 15 ml (1 tablespoon) olive oil in the bottom of the bowl. Put the dough in and turn to coat with oil. Cover the bowl and lit it sit in a warm place for 1 hour. Punch your fist into the centre of the dough to deflate it. Grease a baking sheet with 10 ml (2 teaspoons) olive oil. Turn the dough onto the baking sheet and press out to the corners of the tray. If the dough shrinks back, let it sit for 10 minutes and repress. Cover the dough with a towel and let it sit for 20 minutes. Preheat the oven to 450 F.
Press your fingertips into the dough to make many small indentations. Drizzle the surface with 25 ml (2 tablespoons) olive oil. Sprinkle the herbs over the surface. Bake for 25 to 30 minutes until the focaccia is a nice golden colour. Brush the surface with 15 ml (1 tablespoon) olive oil and cut into serving size squares. Yum! This sounds like a bread that I would really enjoy! If you like a chewy focaccia you would love this.